First, I need to make a confession – this skirt isn’t quite finished. All that’s left is to hem the shell, but it has been sitting like that for a while now so it is time to admit that I’m unlikely to finish this any time soon. However, I learnt a lot while making this and feel it was an important part of my learning to sew journey so want to blog about it. The pattern is the Naughty Secretary skirt from Diana Rupp‘s Sew Everything Workshop book, which I discovered when I took her Craftsy Sewing Studio class. I really enjoyed the class, which features two projects – a simple cushion cover and this skirt. While pencil skirts are not my usual style, I had enough fabric left over from my Miette skirt to make this so thought I’d give it a go. Making the shell went pretty smoothly. 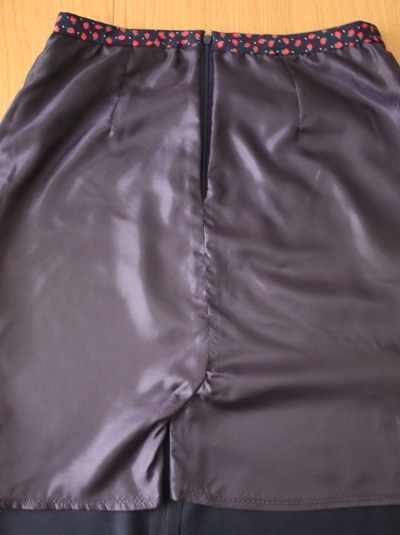 I’m quite happy with the invisible zip – helped out from the extra practice I got while struggling with the toile zip! There isn’t a waistband, instead bias tape is used as a facing. I’d recently brought some navy blue cotton with a strawberry print so decided to make my own bias tape using this for a fun detail on the inside. I understitched the facing so that it would lie flat and not peak out. This little detail is my favourite part of the skirt. I definitely wanted to line this so I could wear it all year round and not get annoyed by the skirt riding up when wearing tights. Initially I brought a fairly cheap lining fabric from Goldhawk Road, but it felt horrible when I was pressing it in preparation for cutting – very clingy and lots of static, definitely wouldn’t do. So instead I ended up buying a lining fabric from John Lewis that cost as much per metre as the main fabric, but it feels lovely and was easy to work with. 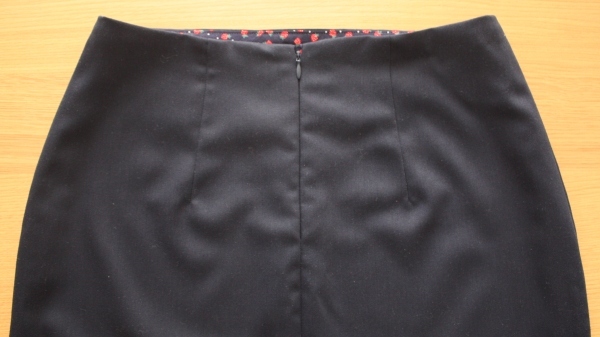 The class goes through making up the lining in the same way as the main skirt, which is obviously fine, but I didn’t want to have the lining showing through the slit. 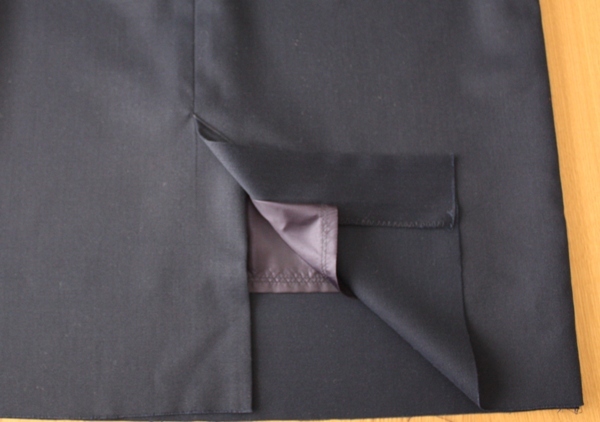 So I was very happy when I found this tutorial on sewing a vent lining. I’d gone through all the steps for drafting the lining including adding a bit of extra room around the hips, so it was disappointing when I tried the lining on and found it was too tight. I guess my main fabric must have a bit of give, but the lining doesn’t. I unpicked the seams and sewed again with as small a seam allowance as I could get away with, so it is now wearable but still a bit tight when sitting down. I tried to sew the curves above the lining vent by machine, but was having such a hard time getting the concave and convex curves to match properly that I ended up hand sewing this bit. 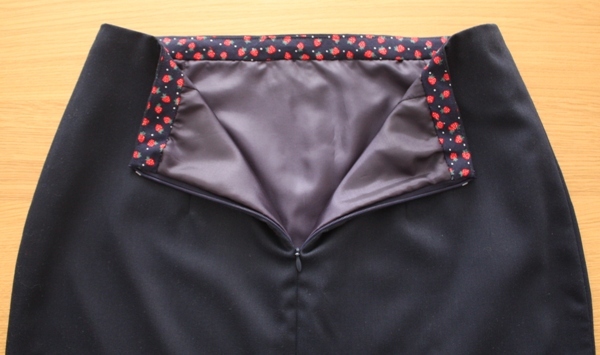 I am happy with the end result of the vent though – the lining is nicely attached and is unlikely to show when wearing. So why don’t I just quickly machine hem the skirt and be done with it? – I’m afraid the perfectionist in me won’t allow it! I’ve finished the waistband such that stitching is not visible on the outside and feel the hem ought to get the same treatment. If I think I’ll wear this skirt (or a friend would like it), I’ll be more than happy to take the time to slip stitch the hem, but for now I’d rather spend my craft time on other projects. It seems such a shame to leave it un-hemmed for now because it looks like a super little skirt that would be a brilliant basic for your wardrobe, but I also agree that other projects catch you eye and you want to move onto other sewing things. What’s you next craft project Alex? Its funny, writing about this skirt has reminded me that I have already spent a LOT of time working on it, so I agree with you that it is a shame to leave it un-hemmed, perhaps this will provide the motivation needed to get it finished! Hey Alex you are on the Colette sewing blog! Featured with your Belcarra blouse – how cool!! Ooo, I hadn’t seen that yet, thanks for letting me know!